In 2018, we can look back on the tenth anniversary of a project we are not only immensely proud of, but that has also greatly enhanced our expertise with the wealth of experience we have gained in our production process. 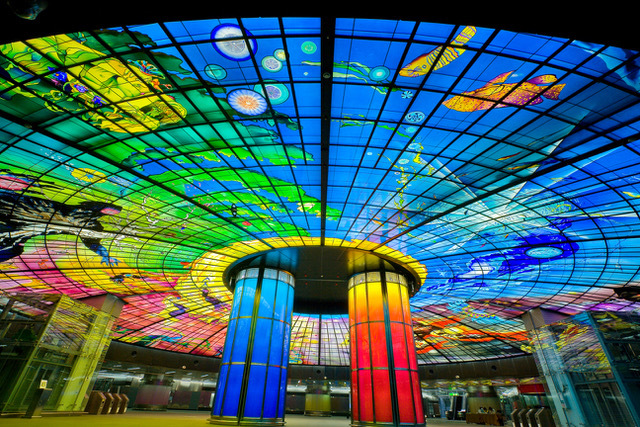 What we are referring to is the Dome of Light, a monumental installation at a Taiwanese subway station, which was until recently still considered the world’s largest piece of contiguous leaded glazing. The work was created by the artist Narcissus Quagliata who was born in Rome in 1942. The concept Quagliata’s work is based on is to communicate to the station’s users the idea of humanity and to shape the relationships of human beings with each other, of human beings with nature and with everything else. If they establish these on earth and harmonize with each other, his view is that there can be no hatred or war. 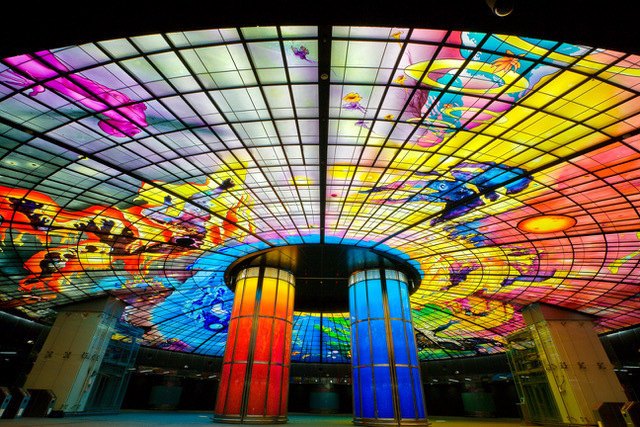 Thematically the Dome of Light deals with the four elements of water, earth, light and fire, which are given expression especially in the ceiling. However, the two supporting pillars in blue and red, which represent the Chinese principle of yin and yang, are also of major significance. Formosa Boulevard Station is located in der Taiwanese city of Kaohsiung at the point where the red and orange subway lines intersect. 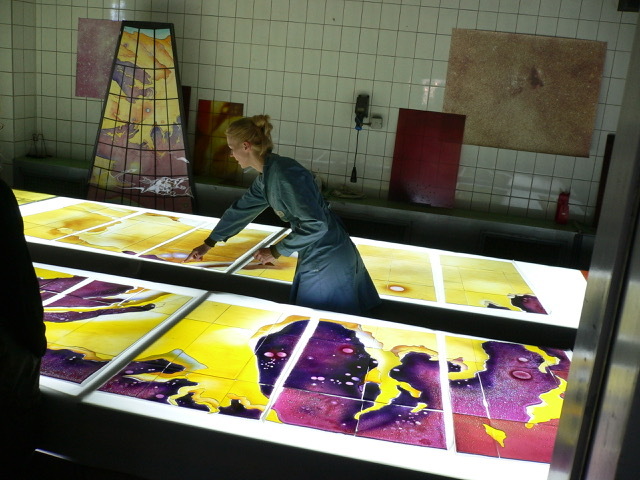 Due to its size, production of the work at Derix Glasstudios lasted from 2005 to 2007. 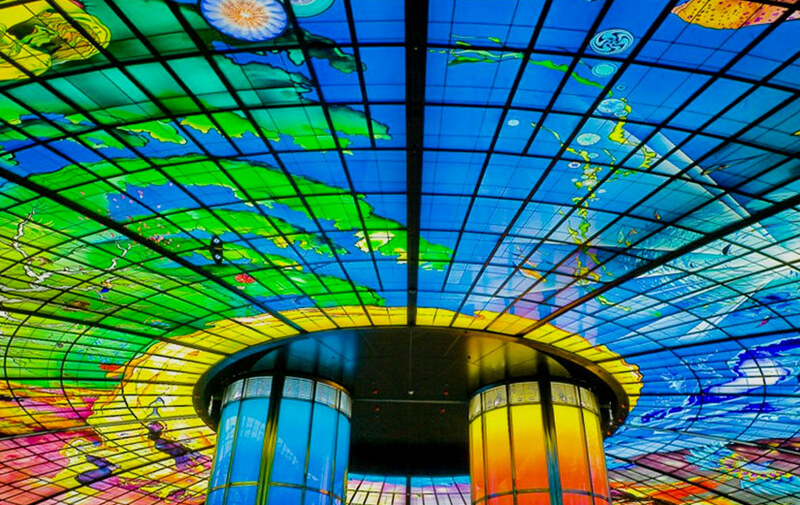 The Dome of Light’s underground glass ceiling has a diameter of 30 meters (100 feet) and an area of 670 square meters (7,200 square feet). It is composed of 16 segments with at most 72 panels, for a total of 1,137 individual panels that consist of different types of glass, including one third mouth-blown Lambertsglas, float and bullseye glass as well as mouth-blown Murano rondels. 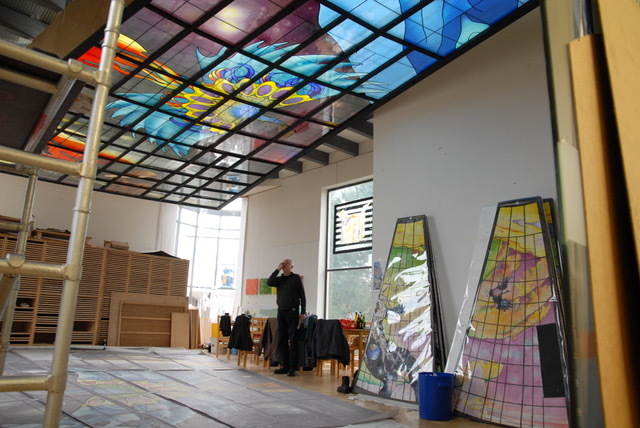 Around 635 square meters were produced at Derix Glasstudios. The remainder comprised fusing elements from Mexico as well as rondels from Murano. The techniques used in the glass production included etching, airbrushing and fusing. 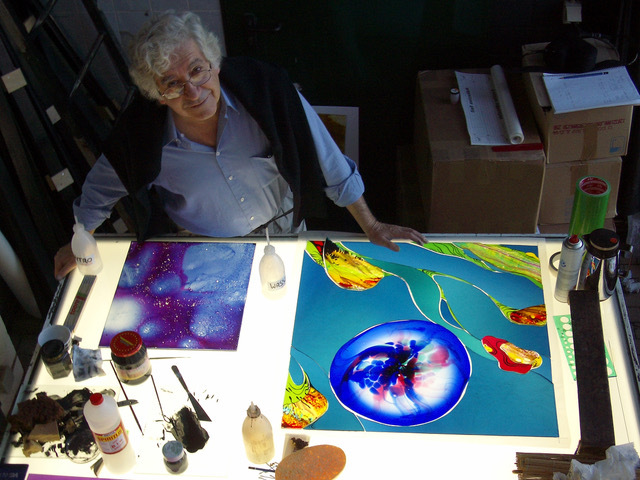 The majority of the figurative paintings are from the hand of the artist himself; for some of the work, such as airbrushing, he was present for most of the time. Working with Narcissus Quagliata was very stimulating and exciting, but also quite challenging. Together with the artist, we clearly pushed the boundaries of glass painting further than ever before, if not exceeded them. In order to execute his ideas, we had to develop completely new techniques for float, fusing panes and real antique glass and implement them in practice. 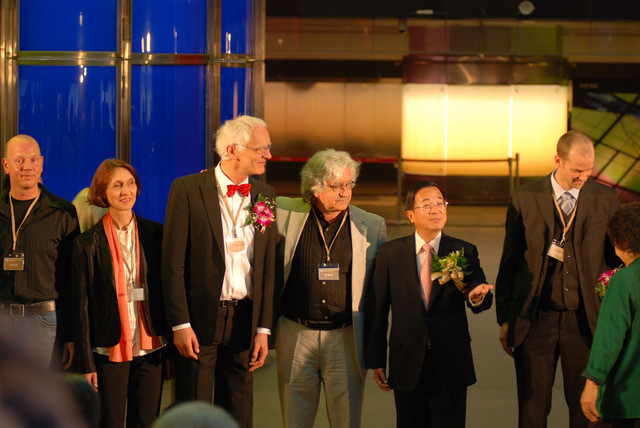 Of course, the sheer size of the work was a very special challenge for us. With 1,137 panels, each of which were put together from several glass elements, in addition to our creative work and craftsmanship, the logistics and organization were the most important factors. For example, we had to make clear at all times where each panel and individual piece is located at any time. Was it just cut or painted or already leaded? At times, we included more than 20 staff in the project, had to provide new premises for processing and storage as well as set up a very specific production plan. As mentioned above, in working on this project, we were able to gain plenty of valuable experience, which was also but not only associated with pure numbers and its size. 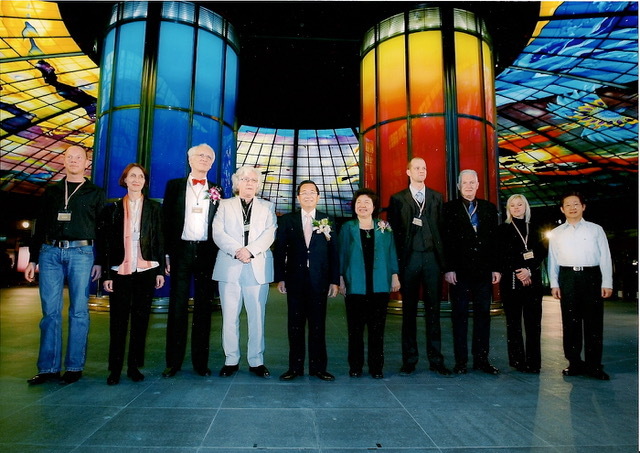 For Derix Glasstudios the Dome of Light is a treasure trove of precious memories, establishing longstanding friendships that last to the present day, as well as our pride in and gratitude for having been part of this wonderful team. 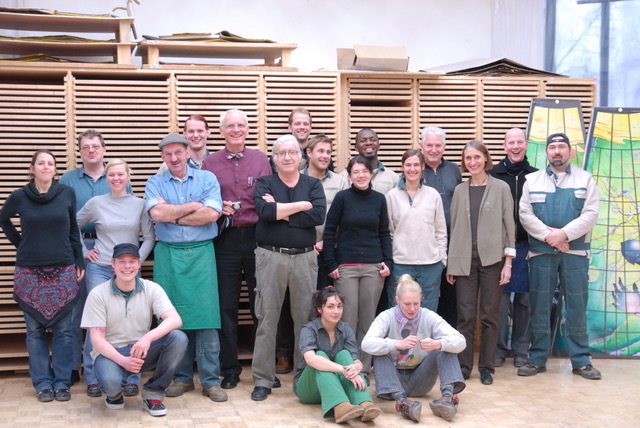 The tenth anniversary of its completion is therefore a special occasion for us – to celebrate, to pause and reflect on our pride and what we have achieved but also looking to the future with optimism, and being able to tackle a project of this kind based on our experience and expertise at Derix Glasstudios at any time again.